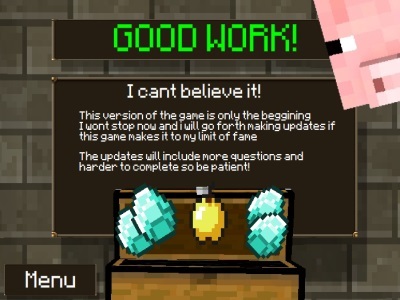 Minecraft Quiz v0.5 is another Minecraft quiz. You mission is to give answers to all of the questions correctly. This quiz has 20 questions that you ought to read them carefully. If you answer a question wrong, you have two options including answering it again or turning back the beginning. However, this quiz has some difference from others. Several questions have more than one correct answer. Showing or widening your knowledge of Minecraft by answering 20 questions in this game! We welcome you to enjoy other games displaying on our site. Thank for your participation very much! Minecraft Quiz v0.5 is played with the mouse.